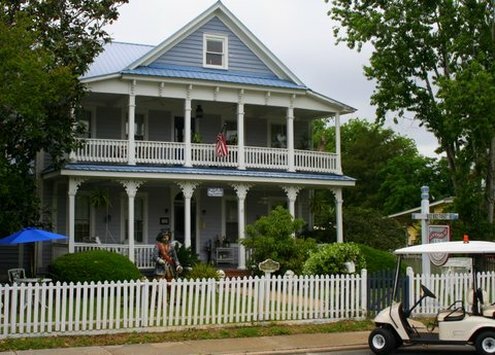 There is something special about the Goodbread House Inn Bed & Breakfast in St. Mary's, Georgia. You feel it as soon as you stand at the white picket fence surrounding the green lawn that leads up to the 150 year old home. The porch swing - swaying gently in the breeze - seems to beckon you in for a relaxing visit. The white window frames on the light-blue face of the house remind you of the synchronicity of white clouds floating lazily through a beautiful blue sky on a Summer day. A quaint sign invites you in with the words, “Enter as strangers. Leave as friends.” This is a special place - you can just feel it. The Goodbread House Inn is owned by Mardja Gray - a Steel Magnolia and a Sweet Potato Queen! The vibe of the Goodbread House Inn is definitely a byproduct of this artistic and beautiful southern belle. Mardja is a Certified Myers-Briggs Specialist. She understands unique personality types. She "has the unique talent of making an immediate connection to a guest's personal style – how they like to communicate, and other individual preferences." Her soft-spoken and graceful manner is just part of her natural charm as she communicates with her guests in the way that best fits their needs. Downtown St. Mary’s is listed on the National Historic Registry. The history of St. Mary’s includes Guale, Timucuan and Yamacraw Indians, followed by a Spanish Occupation in the 1500's, British Occupation in the 1600's, American ownership after the Revolutionary War and a second British Occupation during the War of 1812. It is an incredible history! The Goodbread House has a fascinating history as well. It was built in 1870 by Samuel Burns. Burns sold it to Ralph Sandiford. In 1902 Sandiford sold it to a steamboat captain named Walton Goodbread. The Goodbread (formerly Gutbrodt) family had come to the USA from Germany in 1731. They settled in Philadelphia. Goodbread descendents migrated south, eventually settling in Camden County, Georgia. The Goodbreads fought in the Revolutionary War, the War of 1812, and served in the Confederate Army in the Civil War. In 1918, Kate Brandon Bagwell and her sisters, Sallie, Semora, and Ethel, bought The Goodbread House. They needed it to house the overflow customers from their Riverview Hotel - still just steps away from The Goodbread House Inn. Eventually the Goodbread House became Dixon's Boarding House which served "family-style lunch and dinner to locals and visitors alike." It was renovated in the early 1980's to retain the charm of its' original 1870's architecture. Under Mardja Gray's care, the Goodbread House Inn is a wonderful mixture of antique beauty and themed suites. "Romance flourishes inside the gracious rooms of The Goodbread House so rooms are named after famous lovers. No matter which room you choose, the spirit of romance is sure to inspire," she posts on her website. "No, I don't think I will kiss you, although you need kissing badly. That's what's wrong with you. You should be kissed and often, by someone who knows how." -Swash buckling, blockade runner, Captain Rhett Butler, Circa 1861. Everything about this suite is irresistible. A double fireplace extends into an oversized bath which is adorned with a vintage claw foot tub and step in shower. Being on the first floor, facing the front porch with swings just waiting for you, the Rhett & Scarlett Suite greets each sunrise, bathed in gold, and softened by a night of serenity. These star-crossed lovers never found the peace you'll enjoy in their namesake suite. Just across from the Gable & Lombard Suite, the Guinevere & Lancelot Suite is upstairs facing the veranda and convenient for friends traveling together. Warm and cozy, it features an oversized bath and distinctive pine furniture. Passion rules! And it is such stuff as dreams are made on—simply unavoidable in this luscious suite located upstairs in the rear for extra privacy. Two Queen Beds. Claw-footed tub/shower in an oversized bath accent this suite complimented by antiques and stained glass. Talk about chemistry! Sizzling is the theme of this spacious room with California king sized bed, heart plank floors, and brick fireplace. Upstairs, facing covered veranda, the Gable & Lombard Suite has the easiest entrance. 'Splain this one, Lucy. Two double beds. This suite is perfect for family bookings, and adjoins the Rhett & Scarlett Suite. A favorite among friends. Private bath with shower. The fiery passion of Bogie and Bacall can rekindle the night in this private suite with its own foyer. A classic fainting sofa graces the intimate space in the quiet corner of the Goodbread House. Breakfast is served in a beautifully decorated parlor. Mardja's goal is to make every breakfast a "sumptuous breakfast" for her guests. During our visit, pastries and lemonade were available all afternoon as well. Would you like to organize a vacation for a large group or family? Mardja offers a special rate for guests to rent the entire Goodbread House! This is a great idea for special family holidays like Thanksgiving or Christmas! Imagine awakening on a holiday morning to coffee in the historic parlor or on the second floor verandah. Do you want to visit the world-famous Cumberland Island National Seashore (National Park)? This amazing island just off the shore only allows 300 visitors a day. Mardja has a package where she arranges ferry tickets and even your lunches! Would you like to enjoy the sunset aboard a sailboat? Mardja can arrange a sailboat charter complete with cocktails. Have you dreamed about a beautiful southern wedding? One of Mardja's best friends in a nondenominational minister who performs weddings. Are you looking for a romantic getaway? Mardja offers a Romance Package that includes a one or two night stay for two, a Social in the parlor with desserts and beverages, two tickets for the ferry to Cumberland Island, and dinner for two at one of three nearby restaurants. If you enjoy peace, tranquility, natural beauty and history, St. Mary's, Georgia should be on your list of upcoming vacation spots. And - if you are looking for welcoming, romantic, historic accommodations in St. Mary's, the Goodbread House Inn Bed & Breakfast is your perfect choice. Watch a video of the Goodbread House Inn Bed & Breakfast below.